I have a bunch of books that had recent media options and announcements but here’s the full listings of books + quantities I have. If interested, email me at agentpoyo@gmail.com as I will sell these first come, first serve. I will give the first interested party that commits to buy 24 hours to buy before I sell to the next party that is interested. If you email me with just an inquiry (if it’s still available but without a commit to buy), I will only give you 4 hours to reply with a commit to buy or not buy before selling to the next interested party. Feel free to give me Best Offers as well for any, I might just bite. But please do be fair in the best offers, I’m attempting to list these under cover already from scanning eBay and other sources before setting my prices. Also, do not paypal me at agentpoyo@gmail.com as that is not my paypal address. Please confirm that the books are still available since we have to calculate shipping as well. Thanks. The format will be Quantity Available x Title : Price Each. All books are NM condition and first prints unless otherwise noted. The links will take you to eBay to compare prices, etc. 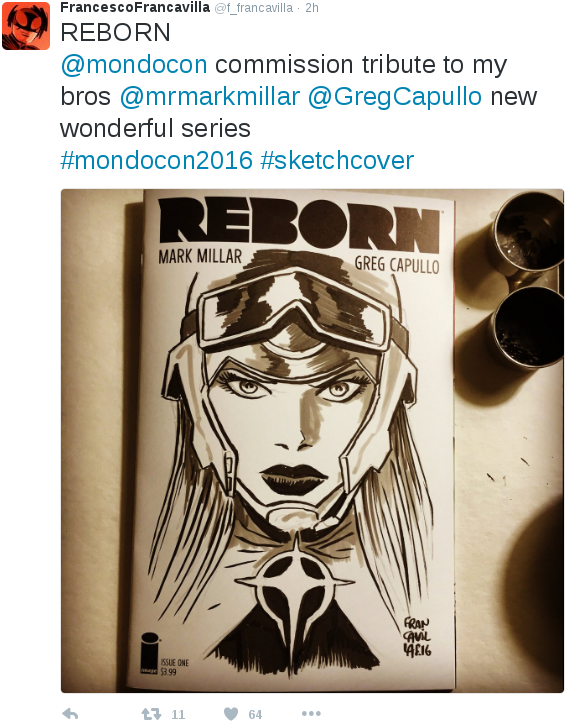 Below is snapshot from Francavilla’s Twitter he posted after he completed. So if you’re interested, please contact me via email. That’s including offers as well. I will try and keep this list updated in the article or in the comments. Also, just to add to this sale a little tidbit. If you inquire about a book and say you want it while others possibly inquiring about it as well, once you say you’re committed to buying, you’ll have 24 hours until I sell it to the next interested party. This way we don’t leave others in limbo if they’re wanting the same book. Basically, first come, first serve. I got two others in line for that one. Waiting on the first person who emailed me. So I’ll put you down as the 3rd person interested. Thanks. Sorry AL, someone else beat ya as it’s been sold and already paid for. Thanks for inquiring though. Sorry about the site sluggishness and unsreponsiveness, had some issues on the backend. Hopefully all is good, monitoring the server now. Alita Battle Angel is really great. Did you see Battle Angel Alita already Alana? I’m looking forward to it but haven’t heard that much about it yet review wise. She downloads the not so legal versions. It’s not in theaters until the 14th. I’d give it two thumbs up it’s one of the best movies so far this year, and it appears there will be more than one movie. Yeah, the Reborn heat didnt peak for long.